Msn Password Finder is Msn messenger password finder software to retrieve saved misplaced or missing login and password from MSN Explorer. Hotmail password viewer tool decrypts and restores all MSN account information, secret code. 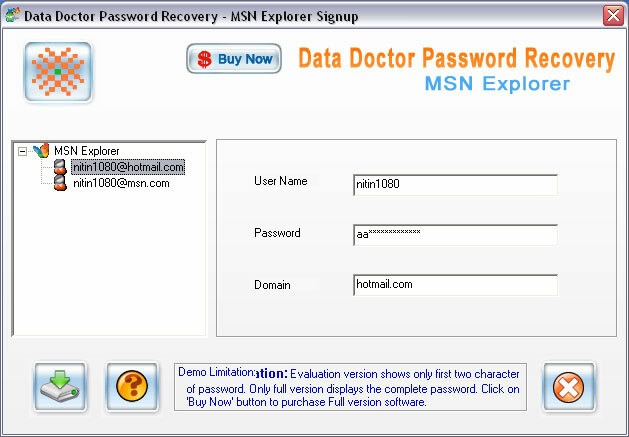 MSN password recovery utility instantly recovers and displays all forgotten usernames, unreadable asterisk or dot multilingual passwords from Msn explorer. Msn password viewer supports all windows operating system. ...... 0. Password revealer utility retrieves lost, missing or deleted login information's like user name, lengthy or complex secret codes with detail account server information. Msn Password Finder is MSN Explorer password breaker software restores all login data and hidden passwords if Remember My Password or save password check box is checked. Msn Password Finder is MSN messenger password restoration software reveals your deleted, forgotten encrypted passwords due to manual deletion or any computer error. Msn Password Finder software decode all encrypted special character ($ @ # *!) password just by clicking on MSN account or Hotmail id of user on the left side of software screenshot. Msn Password Finder is MSN password viewer application supports all windows operating system including Windows Vista. Qweas is providing links to Msn Password Finder V3.0.1.5 as a courtesy, and makes no representations regarding Msn Password Finder or any other applications or any information related thereto. Any questions, complaints or claims regarding this application Msn Password Finder V3.0.1.5 must be directed to the appropriate software vendor. You may click the publisher link of Msn Password Finder on the top of this page to get more details about the vendor.